Friday I went out finally after being sick for what seems like an eternity, I'm not 100% and I'm still getting sick to my stomach from sinus issues but I can at least do stuff now. I decided I really wanted to put some makeup on because I hadn't for over a week. Anyway here is the look I ended up doing. What a beautiful look. I love your awesome blending and the liner makes the look even more amazing! It's so bright. Wow... just, wow. The liner is my favourite part I think! Aaaah, this is seriously HOT!! Love it! Love this and your brows are amazing! Too good. 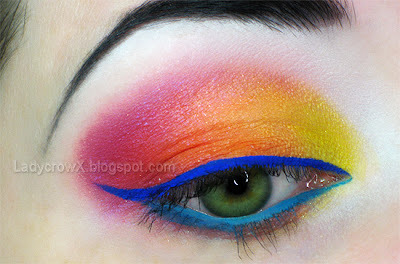 The double blue liner <3 I want! !